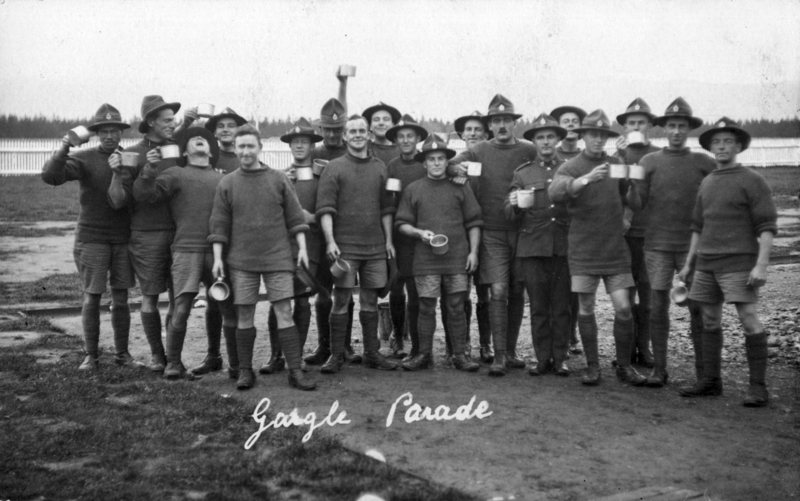 Soldiers at a compulsory gargle parade. Training, exercise, good food and strict hygiene were all designed to keep the men healthy. But south of the main road were hospital facilities for the sick. Later, more wards were added for various diseases. Dental health was important to the army and many men received their first dental treatment during the war. The experience at Trentham Camp in 1915, and the past history of armies, made the New Zealand Army aware of health and hygiene. The barracks and hospitals were designed with the best advice, paying attention to fresh air and cleanliness. Troops had a daily gargle for minor throat infections and they were inoculated against various diseases. There was a daily sick parade to assess men who did not feel well. Minor operations took place at Greytown Hospital while, in serious cases, men were treated in Wellington or discharged from the army. Until the 1918 influenza epidemic, the death rate in camp was less than the general population. The two main hospital wards were called rotundas or octagons, accommodating about 160 each. Special wards for infectious diseases and venereal disease were added. The hospital precinct had its own kitchens and accommodation for doctors, male orderlies and nurses. Poor dental health was a big problem and the Army Dental Corps was formed in 1915. Teeth were first checked at Trentham and each man had to have a toothbrush. A dental hospital and a workshop (to make and repair dentures) were built near the main hospital. By 1917 there were more than 50 men working in the dental area.